What a fantastic Friday Feast we have this week! Drape yourself over a lusciously velvet chaise-longue and get ready to indulge because you are about to be delighted (in the politest possible way) by best-selling regency-set historical romance author and two-time RITA finalist, Christina Brooke. Christina is a bit of a star in the Australian romance writing firmament, being the first Australian to win a Romance Writers of America Golden Heart Award. Besides best-sellerdom and RITA finals (the Romance Writers of America’s equivalent of an Academy Award nomination), Christina has also been nominated for a Romantic Times Reviewer’s Choice Award, Bookseller’s Best and our own Romantic Book of the Year Award. In other words, Feasters, she’s a bloody good author! Her latest release, A Duchess to Remember, is out now. Check it out. Oh, you want that, don’t you? I can see your itchy mouse clicking finger from here. Well here is all the linky goodness you need to indulge. For Australian readers, try Booktopia and Bookworld.com.au, both of which also have the ebooks. You can also buy the paperback and Kindle versions at Amazon. For more links, visit the A Duchess to Remember page on Christina’s website. Now, crook that little pinkie, arrange that napkin, and settle down for a spot of high tea with Christina Brooke! Hi everyone and thank you, Cathryn, for having me here today for Friday Feast! I love these segments, so I jumped at the chance when Cathryn asked me to write one. The French said the only good thing about English cuisine is breakfast, but I can’t agree with that. My absolute favorite meal of any must be the English cream tea or, if you want to go the whole hog, the high tea. Cream teas are what many in Australia call the Devonshire tea: scones with jam and cream accompanied by a pot of tea. The last time I was in England I ate so many cream teas that I didn’t want to look at another scone for quite a while afterward! And of course, here in Australia you don’t get that amazing clotted cream that’s almost as hard as a pat of butter like you do over in England. Certainly not brilliant for the waistline but pure heaven when you’re eating it. Particularly if you’re eating it in the garden of a stately home or in the Pump Room in Bath. 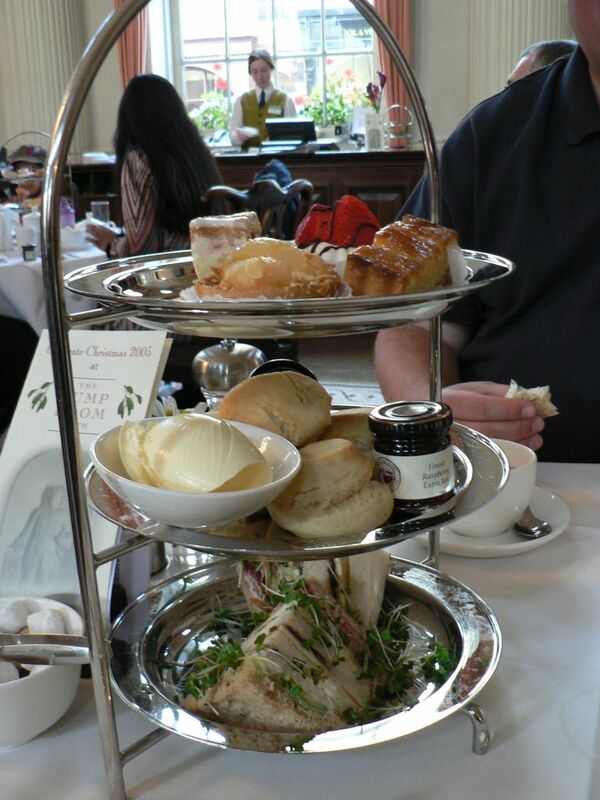 And of course there’s the cream tea’s fancier, more refined cousin, the high tea. This is usually served on a three-tiered plate, with ribbon sandwiches made of cucumber and cream cheese, smoked salmon and baby capers, ham and Dijon mustard and so forth making up the lowest tier. Then you have the hot savory tier, which will be tiny quiches, savory tarts, little crostini, pinwheel pancake treats or other tidbits. And on the final level, there are sweets. Bite-sized lemon curd tarts, heart-shaped cakes dusted with icing sugar, pastel macaroons, meringues studded with lavender, and of course the scone, light as air and topped with strawberry conserve and cream. There is a magical place in Brisbane called “Room with Roses” where I like to go with my mother and enjoy an excellent high tea. 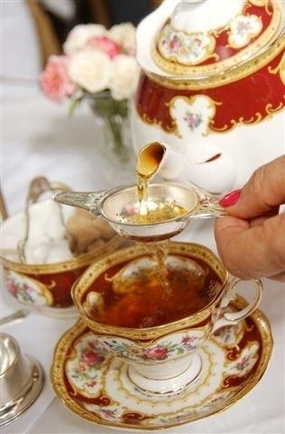 Some serve champagne with a high tea but I say you cannot go past a good strong cuppa. TO MAKE MACKROONS Take the whites of eight eggs and beate them very well with a white rod. Take a pound loafe sugar very firmly beaten a pound and half of blanched almonds very well beaten with a little rose water. Mix them altogether, put to them a little rose water, so lay it on White Wafers, a spoonful in a Place. Make them up long Ways, Scrape hard sugar on them and bake them. Ahh, macaroons. Such sweetly civilized morsels and a perfect accompaniment to a good cuppa. And now we have whole shops dedicated to them. In fact, I discovered one just last weekend in Hardware Lane in Melbourne, complete with line-up of slavering customers out the door. So, my lovely Feasters, you heard our fabulous guest, start commenting. There’s a wonderful prize up for grabs. 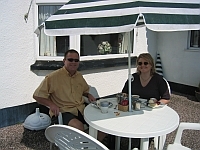 Best morning tea for me has to be Devonshire tea in Devon, enjoyed outside on a stunning summer’s morning. A good brew, gorgeously light scones, delicious jam and that amazing clotted cream Christina talked about. Nothing special yet somehow absolutely perfect. Giveaway closes midnight, Tuesday 4th September AEST and it’s open internationally. Yippee!!!! If you’d like to know more about Christina and her amazing, award-winning books, including the famous Ministry of Marriage series, please visit her website. You can also connect via Facebook, Twitter and Goodreads. This giveaway has now closed. Thanks to everyone who took part. You all gave Christina and me a lot of smiles. Congratulations to Julie who has won a copy of Christina’s gorgeous new release, A Duchess To Remember. This entry was posted in Friday Feast and tagged A Duchess To Remember, Australian romance authors, Australian Writers, Booktopia, Cathryn Hein, Christina Brooke, Cooking, Food, Friday Feast, High Tea, Macaroons, promo, Recipes, Romance Writers of Australia on August 31, 2012 by cathrynhein.